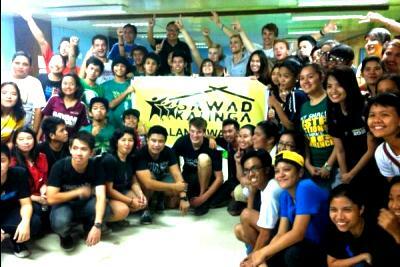 We thank everyone who rose up to the challenge and became part of Operation Walang Iwanan. These miracles of solidarity can help us face any calamity, but it is this same spirit that can end the biggest disaster we still face as a nation. As one Team GK, let us continue to face poverty head on! THIS JUST IN! :) More miracles of solidarity! Because we put the needs of the poor first, God will also take care of our own needs. And we didn't even ask for it! God is good! "The Skoll Foundation will make a small emergency grant to provide funding for you to ensure your offices and equipment are safe and high-functioning as soon as possible so that you are able to return to your core work soon as well as continue to provide services to the GK community and beyond." Operation Walang Iwanan may be over (for now), but the spirit remains. More than a slogan, this is our GK family's way of life. Proud to be GK, proud to be Pinoy! Today, Team GK was able to give out 1,275 relief packs to families in Minalin (Pampanga), 400 to families in Bataan, and 418 to families in Rizal, Pasig and Pateros. During the 5 days of Operation Walang Iwanan, the generosity of our partners and the heroism of our 1,134 volunteers allowed us to give out a total of 9,767 relief packs to affected families. 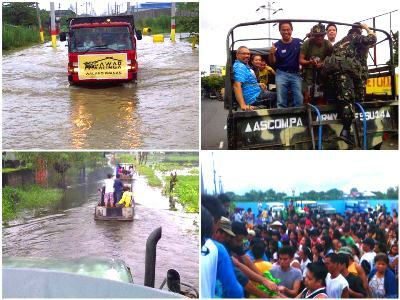 Flooded roads will not hinder us from reaching out and giving 1,275 food packs to the affected families of Minalin, Pampanga. We will forever bring with us the smiles of our brothers and sisters whose town has been submerged in flood waters for 5 days now. Many thanks to the generosity of our donors and the unwavering energy and heroism of our volunteers. Team GK, mission accomplished! Still in disbelief that barangay after barangay, town after town could be submerged like this. We finally reached Minalin, Pampanga and it is now 5 days that this town has been submerged in water. 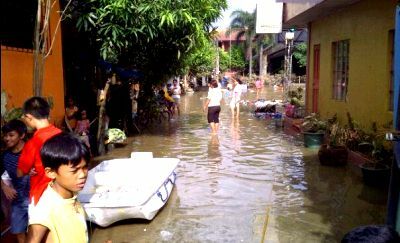 It was heartbreaking to see, and we had to use alternative transportation to get to our drop off point in Brgy. San Francisco, one of the most isolated areas affected by the flooding. We are now on our way to giving out 1,000 food packs to the families here. We will not leave anyone behind! Long stretches of road remain flooded despite the high sun. Passing through waist-deep water in Sapa, San Matias on our way to Minalin, Pampanga. 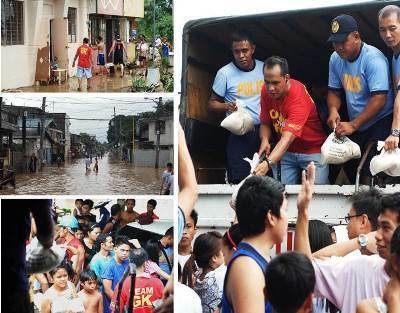 Yesterday, there was water practically everywhere in San Luis, Pampanga, but the smiles of the residents and the heroism of the volunteers shone through the darkness. Today, our teams are on their way to delivering 1,675 food packs to Minalin (Pampanga) and Bataan. The flood waters are still here, but no matter how hard the road may be, we will try to reach whoever we need to reach and bring hope to our fellowmen. Stand by for updates from the ground. Walang Iwanan! 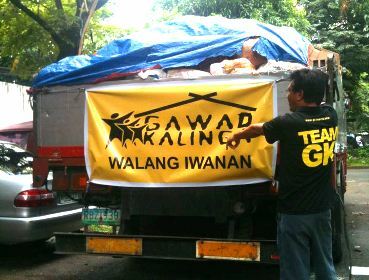 This truck is loaded with 1,675 food packs, and around 35 volunteers are now on their way to Pampanga to deliver them. Around 25 volunteers are also at the Command Center to help with the loading and cleanup! We salute the matchless enthusiasm and energy of our volunteers. It’s almost midnight here at the Relief Center and we just finished packing 2,093 relief packs for tomorrow’s distribution! We salute the dedication of our volunteers, who heeded the call in such short notice. We are happy to report that we were able to surpass our target of 4,000 packs: 7,674 food packs by 1,069 volunteers for 42 communities in 4 days. 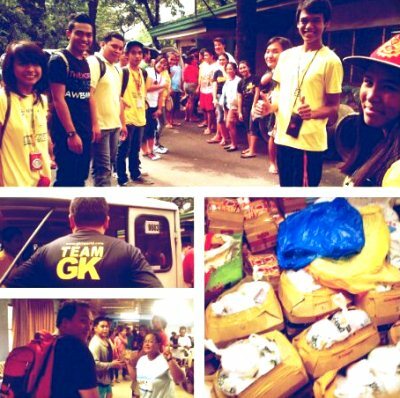 As of 8:20 PM today, Team GK has prepared more than 1,000 new relief packs to be distributed tomorrow. This is in addition to the 1,400 relief packs that were distributed earlier today and the 6,374 that were deployed during the first three days. Through the bayanihan of partners and volunteers, these packs will bring colors of hope to families that for days have seen nothing but dark skies, torrential rainfall and flood. Let’s show our brothers the true meaning of Walang Iwanan! Since our 2pm announcement, more than 100 volunteers answered the call and finished more than 1400 relief packs! 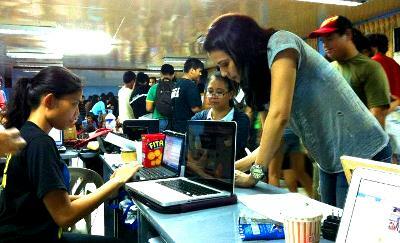 The GK Relief Operation Center at DAR continues to be bustling with busy volunteers. Thousands released today and thousands more on its way. These smiles have taken our hearts away. We will see you again, Bamban, Tarlac. No matter how far, steep, and rough, WE WILL LEAVE NO ONE BEHIND. This bridge is the easiest way for our Aeta brothers and sisters to reach the town proper. They were isolated since it went down because of heavy rains. Let's hope this makeshift bridge will last long to serve its purpose, but we are happy to share that we have distributed relief packs to 600 families in Tarlac. Thank you Lord for keeping our distribution teams safe. We will shift from North NCR to North Luzon. We will shift our relief operations to Pampanga, Tarlac and Bataan starting 2PM today. 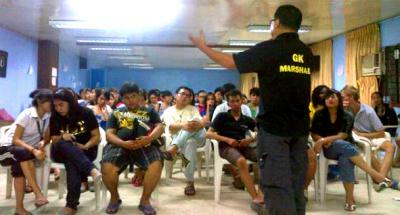 We will maintain our GK Command Center at HRD Training Center, DAR Compound, Quezon Circle. We continue to accept donations. Here we go! Target food packs 3000. We need at least 40 sacks of rice before 5PM. 6,374 food packs by 938 volunteers for 36 communities in 3 days. And we got another special guest in the house. Thank you Kean Cipriano for the goods and for taking your time to join us today! Walang Iwanan! Here at Sinagtala, Q.C. to give food packs to 196 families. We were informed that this area was submerged in a 6 feet high flood water during the heavy rains. Thankful for the capacity to help beyond our GK communities! 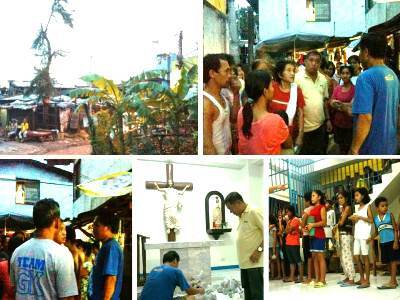 Reaching out beyond GK communities, we distributed 100 food packs for the residents living beside a creek at San Beda, Libis, Q.C. Ate Francia, the Project Director of GK Baluarte, requested for some relief goods not for their own but for the affected families at Odelco Riverside, Brgy. 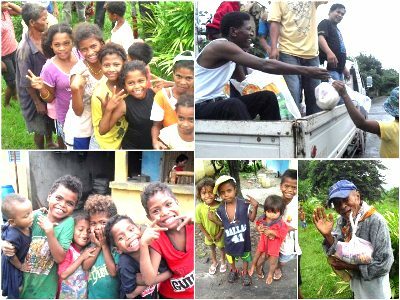 San Bartolome, keeping true to our promise that we will not leave anyone behind! We have provided 100 food packs for them. It is when we start to think of others and not only of ourselves that we truly become our brother's keeper! Saludo kami sa inyo, Team GK Baluarte! We've got a special guest in the house bringing relief goods! Thank you Karylle for dropping by. Today is our last day but hopefully this won't be the last time that we'll see & hear from you! You can still drop off your donations til 6 PM today. We'll announce where to drop off your donations starting tomorrow. Volunteers spending the last few hours repacking food packs & meeting new friends. :) It has been an inspiring 3 days with all of you! Maraming, maraming salamat po! 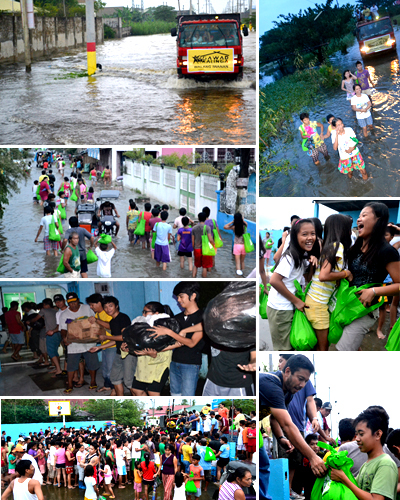 Distribution of 150 packs of relief goods to residents and surrounding communities of GK Selecta, Cainta. 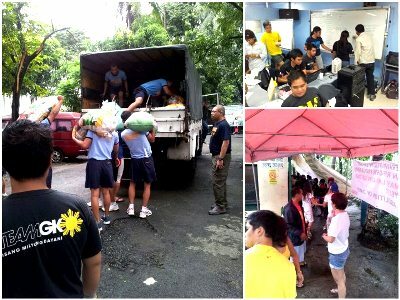 OPERATION WALANG IWANAN Update: We have deployed 2,050 food packs in Baseco, Pasig-Pateros, Tatalon, STC, Madrigal & Pajo as of 1:40 PM today. 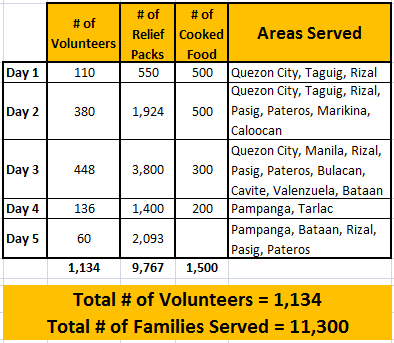 As of today, we have distributed a total of 4,924 food packs to 29 sites. Thank YOU to our (total of) 656 volunteers...and counting. We've got kid volunteers and French volunteers in the house! A lot of our volunteers brave the flood and rain in their areas so they can join us today. Thank YOU! Off to GK Tawi with 15 4x4 Nissan Patrol cars carrying relief goods. Salamat sa Nissan Patrol Club! Woohoo! A big thanks to the volunteers who proved today that heroism can turn tragedy into triumph of the Filipino spirit and to our donors whose generosity allows us to reach so many families in critical need. 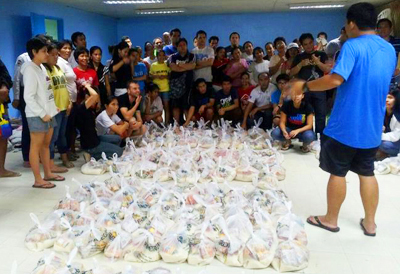 With the bayanihan of 380 volunteers, were able to dispatch 1,924 food packs to 12 GK sites. Tomorrow, we will go full blast in the distribution of relief packs to affected sites. All volunteers who wish to join us should be at the Command Center by 9am for briefing. It has been 15 hours since we started our operations today pero very high pa rin ang energy ng mga kapatid natin dito! Bayanihan line on-going! Stop-dance naman ang peg namin ngayon habang nag papasahan ng mga relief goods! :) We are still online and you can be with us via our live streaming. 6 PM, red signal up and we're still going! Last delivery of 100 sacks of rice for repacking and deployment tonight and first thing tomorrow morning. And we still have about 100 volunteers in the command center! Walang Iwanan isn't a slogan, its our way of life! Proud to be Pinoy, proud to be GK! Despite being sick, Tito Tony Meloto is here with us in the Command Center to inspire our very committed volunteers. "Today, we are witnessing miracles of solidarity because of you. We are starting to realize that we ourselves can craft our destiny together. And calamity only strengthens our resolve to build our country. Thank you for being a hero today and everyday. You are what makes this nation great." Team GK on the move. Deploying goods in the midst of torrential rain. Truck on the right just got back from Pasig/Pateros - unsuccessful in penetrating that area so we're sending the goods to Cavite instead. Truck on the left is deploying to Brgy. Tatalon in QC. 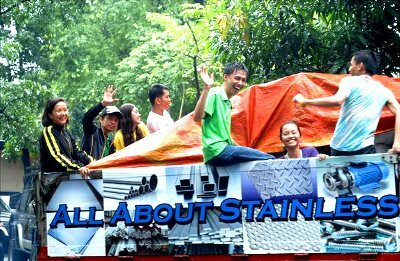 Our volunteers show that the Filipino spirit is indeed waterproof! 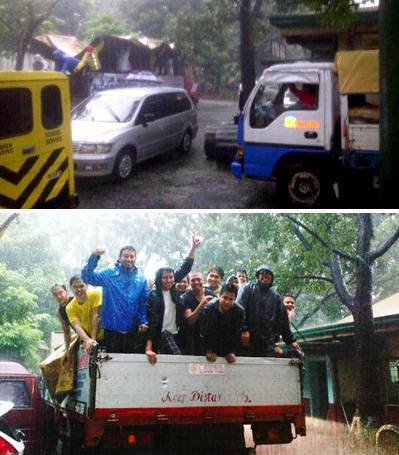 Prayers pls for our relief teams who are braving the rains to send much needed goods to areas that need them the most. As volunteers on ground brave the floods to try and reach affected GK communities in Pasig and Pateros, volunteers in the command center work together to prepare even more relief packs. Keep the goods coming! 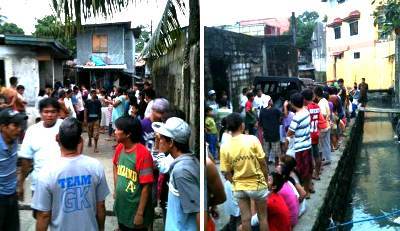 GK volunteers distributed 150 packs of relief goods to the residents of GK Camacho (Brgy. Nangka, Marikina City) and their neighbors. 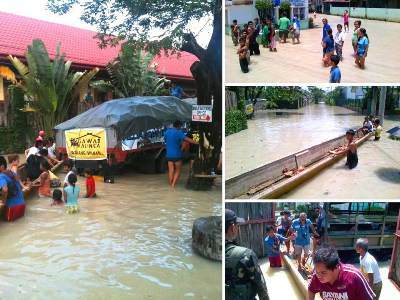 This village sits beside the Marikina River where water rose up to chest level, submerging homes along with their personal belongings. 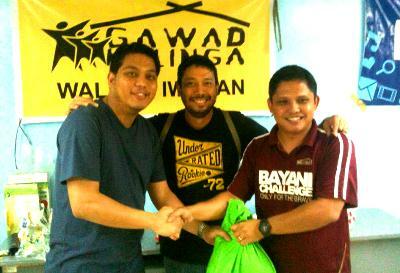 The spirit of bayanihan reigned as we delivered 310 relief packs to GK Brookside in Quezon City. A nearby creek and river overflowed last night, so when we reached the place, some areas were still submerged in flood. Coordinating the destination of goods. Where the heart moves, the resources follow. Volunteers started early today. 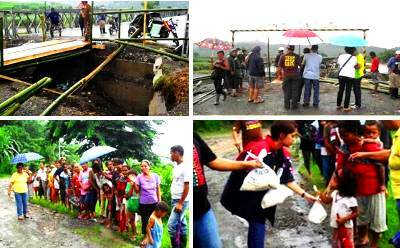 The bayanihan line, passing the food packs to lighten the load and to hasten pace. Mabuhay ka Pinoy! 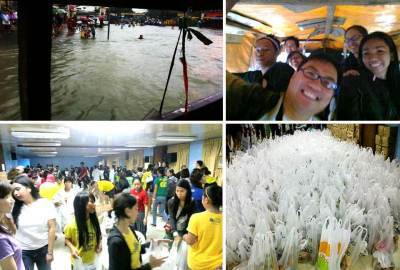 As early as 7am volunteers from Ilocos, Isabela, youths from Gawad Kalinga communities in Quezon City and volunteers who saw the invitation from President Noy's FB Page started to repack food bags. 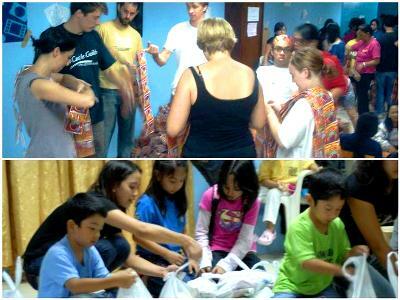 Our goal: to distribute more than 3,000 food packs within the day. Thank you to all those who have been helping us out today, from packing and distributing goods to disseminating the information online and thru text. To all the volunteers, gov't agencies, public & private organizations & everyone doing their best to reach out to those who are in need, mabuhay kayo! We can rise above this together. Thank you also to those who have been praying with and for us. Have a good rest. Tomorrow is another day to help out. No giving up. Walang Iwanan! 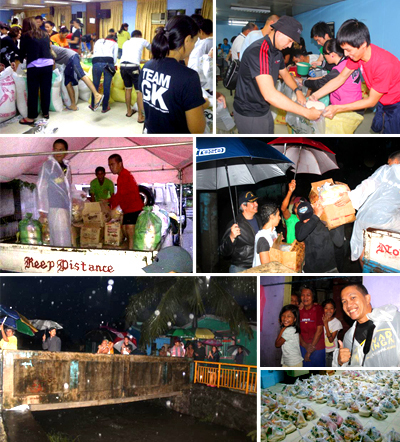 Day 1 of Operation Walang Iwanan: Volunteers braved the rain to deliver 550 relief packs to 6 GK Villages. 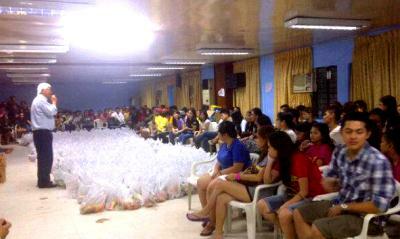 As of 7:28pm, 110 GK volunteers packed 1000+ relief goods! Target: 4000 more by tomorrow. We need YOU! Join us at our command centers to help! TEAM GK on the move! 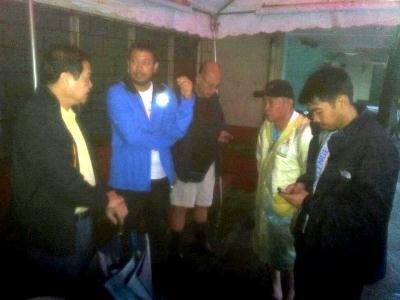 GK Executive Director Luis O is now on his way to QC to set up relief operations in the DAR Gym. We are also looking for any space in the Intramuros area (200 sqm or more) to set up operations for Manila and any big vehicles that can navigate through flood waters to deliver much needed food supply to evacuation centers or to those who are stranded. More details to come after the meeting. 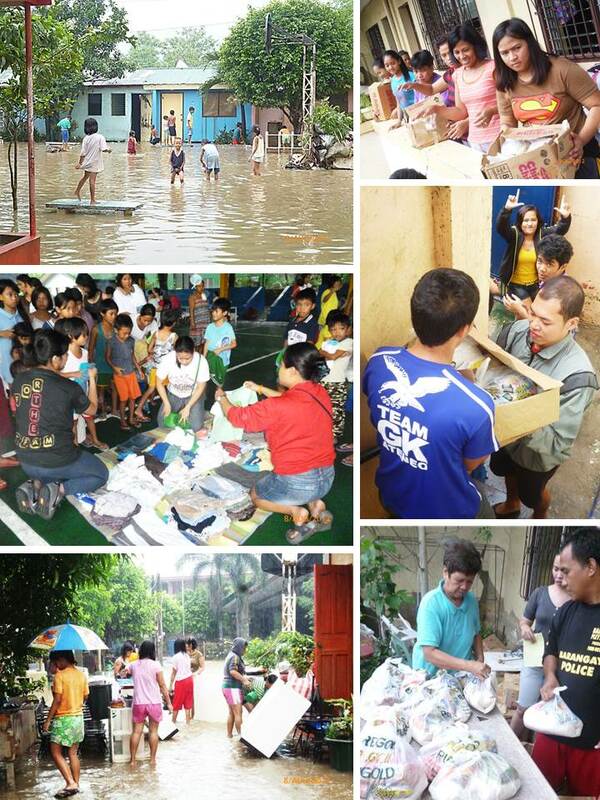 *Note: GK communities serve as distribution centers for affected surrounding communities.